How is psychological abnormality recognised? How many different mental disorders are there, and what are their characteristics? Although there are established guidelines for clinicians working in this area, these have been subject to many criticisms. Exploring how views on this subject have changed over time, and how they vary in different societies, poses important questions about our current practices. 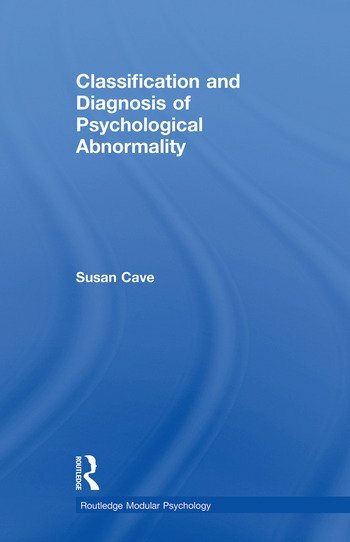 This book provides a brief overview of the current definitions and various explanations for psychological abnormality and then focuses on how society diagnoses and classifies behaviour that is deemed to be 'unusual'. Three key areas of the topic are covered: the procedures involved in the diagnosis and classification of mental disorders (such as schizophrenia); research into the history and origins of multiple personality disorder; and a discussion of the implications of cultural variability (including culture-bound syndromes) for the classification and diagnosis of psychological abnormality. Classification and Diagnosis of Abnormal Psychology is an introductory text suitable for students and teachers of the AQA Psychology A2 specification and is also useful for other groups who work in the field of mental disorder, such as nurses, social workers and therapists. Introduction. The Classification, Diagnosis and Assessment of Mental Disorders. Multiple Personality Disorder. Culture-bound Syndromes. Conclusion. Susan Cave is an examiner and coursework moderator for A Level Psychology and a lecturer in Psychology.